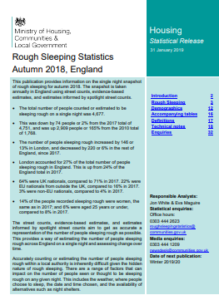 This publication provides information on the single night snapshot of rough sleeping for autumn 2018. The snapshot is taken annually in England using street counts, evidence-based estimates, and estimates informed by spotlight street counts. • The total number of people counted or estimated to be sleeping rough on a single night was 4,677. • This was down by 74 people or 2% from the 2017 total of 4,751, and was up 2,909 people or 165% from the 2010 total of 1,768. • The number of people sleeping rough increased by 146 or 13% in London, and decreased by 220 or 6% in the rest of England, since 2017. • London accounted for 27% of the total number of people sleeping rough in England. This is up from 24% of the England total in 2017. • 64% were UK nationals, compared to 71% in 2017. 22% were EU nationals from outside the UK, compared to 16% in 2017. 3% were non-EU nationals, compared to 4% in 2017. • 14% of the people recorded sleeping rough were women, the same as in 2017; and 6% were aged 25 years or under, compared to 8% in 2017. The street counts, evidence-based estimates, and estimates informed by spotlight street counts aim to get as accurate a representation of the number of people sleeping rough as possible. This provides a way of estimating the number of people sleeping rough across England on a single night and assessing change over time. Accurately counting or estimating the number of people sleeping rough within a local authority is inherently difficult given the hidden nature of rough sleeping. There are a range of factors that can impact on the number of people seen or thought to be sleeping rough on any given night. This includes the weather, where people choose to sleep, the date and time chosen, and the availability of alternatives such as night shelters.